Skeletal muscle sodium channelopathies (SMSCs) including hyperkalemic periodic paralysis (HyperPP), paramyotonia congenita (PC), and sodium channel myotonia are caused by sodium channel gene (SCN4A) mutations, with altered sarcolemal excitability, and can present as episodes of skeletal muscle weakness, paralysis, and myotonia. We report a teenage boy, who presented with features of HyperPP, PC, myotonia congenita, and sodium channel myotonia. His electromyography (EMG) revealed myopathic changes, myotonia, and Fournier EMG pattern I, and posed a diagnostic challenge. Genetic analysis showed Thr704Met mutation in SCN4A gene. While with typical clinical phenotypes, the electromyographic patterns can be used to direct genetic testing, atypical phenotypes may pose diagnostic dilemmas. Clinicians dealing with neuromuscular disorders in children need to be aware of the unusual clinical presentations of SMSC, so that focused genetic testing can be carried out. Skeletal muscle channelopathies (SMSCs) are rare skeletal muscle disorders associated with altered sarcolemal excitability secondary to mutations in genes coding for voltage-gated ion channels. SMSCs are caused by mutations in SCN4A gene on chromosome 17q, which codes for the α subunit of human skeletal muscle sodium channel. Genetic mutations in SCN4A can be easily predicted if clinico-electromyographic phenotypes are typical. , However, atypical overlapping phenotypes pose diagnostic challenges by blurring the phenotypic boundaries. We present a teenage boy, who had a combination of features of hyperkalemic periodic paralysis (HyperPP), PC, myotonia congenita (MC), and sodium channel myotonia. The case report highlights the importance of recognizing unusual clinico-electromyographic phenotypes, which can help guide focused genetic testing. A 14-year-old Asian boy presented to pediatric neurology with 4-year history of episodes of muscle stiffness and weakness in lower limbs, occurring following sitting (resting) for nearly 1 h after exercise. The muscle stiffness episode would improve following shaking of legs ("warm-up effect"). There was no history of difficulty in climbing stairs or running. He was born at term vaginally to unrelated parents. There was no history of decreased fetal movements or polyhydramnios. He did not require active resuscitation at birth and weighed 3.4 kg. There was no history of feeding or breathing difficulties in the neonatal period, and his weaning period was uneventful. He had normal developmental milestones. Family history was remarkable for his father having episodes of muscle stiffness; however, no specific diagnosis was assigned. Physical examination did not reveal dysmorphism or neurocutaneous stigmata. His growth parameters were within normal limits. Gait was normal and Gower sign was negative. There was no evidence of calf muscle hypertrophy or limb weakness (proximal or distal). Tone, power, and deep tendon reflexes were normal in all the four limbs. Creatine kinase (CK) was elevated at 1024 IU/L (25-200). Electromyography (EMG) revealed myopathic changes [Figure 1]. There was evidence of muscle membrane irritability with myotonia, which was highly suggestive of a myotonic disorder. As a result, it was decided to arrange for short exercise testing as part of the myotonia protocol. At room temperature there was mild post-exercise potentiation for about half a minute, followed by recovery toward normal. Cold exposure produced reduction in muscle action potential amplitude to about 50% accompanied by severe clinical weakness. 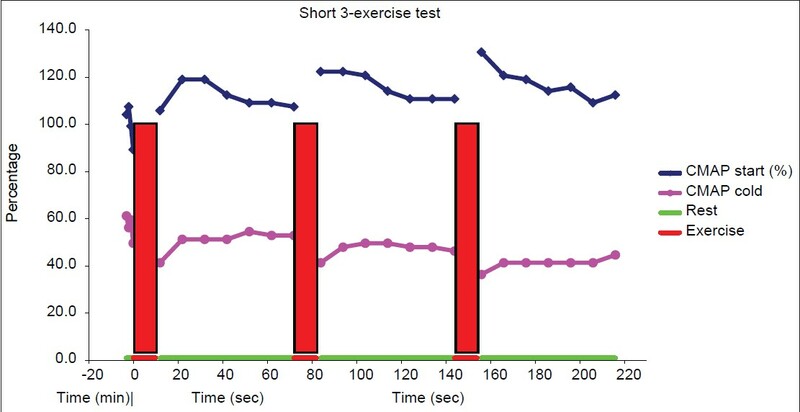 It also exposed a post-exercise drop in amplitude with slight recovery, and a subsequent progressive further decrease in the action potential with serial exercises [Figure 2], which was consistent with features of paramyotonia congenita (PC) (Fournier pattern I). At this point the history and EMG suggested a myotonic disorder, and consequently the long exercise tests were not carried out. Molecular genetic testing was negative for myotonic dystrophy and MC (CLCN1). Further testing detected a heterozygous pathogenic mutation c. 2111C > T; p.Thr704Met in the coding regions (c. 2020-2376) and (c. 4571-4838) of sodium channel type IV α subunit (SCN4A). HyperPP, PC, and sodium channel myotonia are allelic to each other. HyperPP patients present with episodes of muscle weakness triggered by post-exercise rest, potassium-rich food, cold environment, emotional stress, and fasting. Weakness episodes are often interspersed with mild myotonia, which does not interfere with voluntary movements. PC, autosomal dominant in inheritance, presents in the 1 st decade of life with episodes of cold and exercise induced myotonia affecting muscles of face, tongue, and hands predominantly. Paralysis periodica paramyotonica, a myotonic form of HyperPP, represents a mix of clinical features of HyperPP and PC. Sodium channel myotonias generally present with isolated myotonia, and some of the pure sodium channel myotonias can manifest "warm-up effect," which is typically seen in MC. , While myotonia sets in after inactivity in MC, it develops soon after exercise in PC and 10-30 min post-exercise in sodium channel myotonias. Based on the distinct electromyographic patterns, Fournier et al. , devised specialized neurophysiological protocols to guide genetic investigation. Repetitive short (10-20 s) or long (3-5 min) exercise tests, at room temperature and on cooling, generate five EMG patterns: I, II, and III for non-dystrophic myotonias and IV and V for periodic paralyses. HyperPP shows pattern IV, which is characterized by post-exercise increment in compound muscle action potential (CMAP) with further improvement after serial exercise testing. Needle EMG, however, does not reveal myotonic discharges in most of the cases. PC, on the other hand, produces pattern I, which is characterized by post-exercise gradual CMAP decrement, with progressive further decrements following exercise. Most of sodium channel myotonias manifest EMG pattern III,  in which CMAP remains unchanged following exercise with or without cooling. Fournier's protocols aim at using clinical and EMG phenotypes to guide genetic investigation. HyperPP, with EMG pattern IV, is linked to Thr704Met mutation in SCN4A. PC, which shows EMG pattern I both at room temperature and on cooling, is linked to SCN4A: T1313M, R1448C, or R1448H, whereas the PC, which shows EMG pattern I on cooling only, is linked to a rare mutation in SCN4A gene: Q270K. , Our case presented with episodic weakness and myotonia, mainly involving lower limbs, occurring after resting for up to 1 h, which improved after repetitive exercise reflecting "warm-up effect." Distribution of myotonia (lower limbs > upper limbs) was not typical of PC. Differential diagnosis at this stage included MC and HyperPP. A negative CLCN1 gene mutation, however, made the diagnosis of MC less likely. Some of the rare phenotypes of sodium channel myotonias, which are allelic to HyperPP, PC, can manifest warm-up effect and cold sensitivity, as seen in our case. 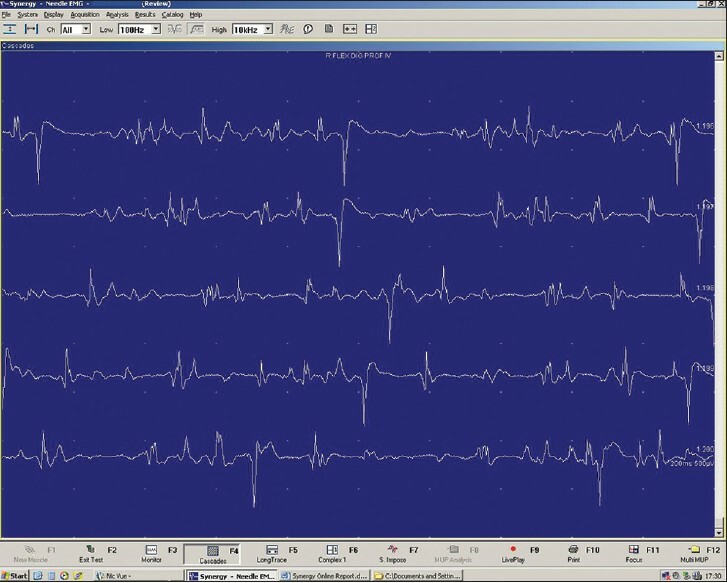 , The presence of myopathic changes in the EMG made HyperPP a possibility. The Fournier pattern I revealed by our case is typical of PC. Our case, therefore, clearly represents an overlapping clinic-electromyographic phenotype encompassing HyperPP, PC, and sodium channel myotonia, which can be explained on the basis of their common allelic basis. Genetic mutation, SCN4A: c. 2111C > T; p.Thr704Met found in our patient, was originally reported in HyperPP. Kim et al. reported phenotypic variation of Thr704Met in a family with paralysis periodica paramyotonia, a type of HyperPP. Our case represents a further phenotypic variation with features of paralysis periodica paramyotonica with "warm-up effect", which is typically seen in MC and some sodium channel myotonias, and exemplifies phenotypic heterogeneity of gene expression in SMSC. Recognition of such atypical phenotypes encompassing features of HyperPP and PC with "warm-up effect" can enable clinicians carry out focused genetic analysis for Thr704Met mutation in SCN4A gene and help reduce investigation cost. Skeletal muscle channelopathies are hereditary disorders of muscle cell ion channels, which result in disturbance of sarcolemal excitability, leading to muscle dysfunction. Diverse genetic mutations can produce variable phenotypes. While typical clinico-electromyographic phenotypes can help guide genetic testing, atypical overlapping presentations may pose diagnostic dilemmas. Our case epitomizes phenotypic complexity stemming from genetic intricacies, which can result in diagnostic difficulties. Clinicians dealing with neuromuscular disorders in children need to be aware of the rare clinical presentations of SMSC, such as paralysis periodica paramyotonica with "warm-up effect", so that focused genetic testing can be carried out. 1. Fournier E, Arzel M, Sternberg D, Vicart S, Laforet P, Eymard B, et al. Electromyography guides toward subgroups of mutations in muscle channelopathies. Ann Neurol 2004;56:650-61. 2. George AL Jr, Ledbetter DH, Kallen RG, Barchi RL. Assignment of human skeletal muscle sodium channel α-subunit gene (SCN4A) to 17q23.1-25.3. Genomics 1991;9:555-6. 3. Fournier E, Viala K, Gervais H, Sternberg D, Arzel-Hézode M, Laforêt P, et al. Cold extends electromyography distinction between ion channel mutations causing myotonia. Ann Neurol 2006;60:356-65. 4. Matthews E, Fialho D, Tan SV, Venance SL, Cannon SC, Sternberg D, et al. The non-dystrophic myotonias: Molecular pathogenesis, diagnosis and treatment. Brain 2010;133(Pt 1):9-22. 5. Jurkat-Rott K, Holzherr B, Fauler M, Lehmann-Horn F. Sodium channelopathies of skeletal muscle result from gain or loss of function. Pflugers Arch 2010;460:239-48. 6. Miller TM, Dias da Silva MR, Miller HA, Kwiecinski H, Mendell JR, Tawil R, et al. Correlating phenotype and genotype in the periodic paralyses. Neurology 2004;63:1647-55. 7. Kim J, Hahn Y, Sohn EH, Lee YJ, Yun JH, Kim JM, et al. Phenotypic variation of a Thr704Met mutation in skeletal sodium channel gene in a family with paralysis periodica paramyotonica. J Neurol Neurosurg Psychiatry 2001;70:618-23. 8. Trip J, Pillen S, Faber CG, van Engelen BG, Zwarts MJ, Drost G. Muscle ultrasound measurements and functional muscle parameters in nondystrophic myotonia suggest structural muscle changes. Neuromuscul Disord 2009;19:462-7. 9. Trivedi J, Statland J, Cannon S, Bundy B, Wang Y, Barohn R, et al. Nondystrophic myotonic disorders: Assessment of myotonia and warm-up phenomenon in various subtypes. Neurology 2008;70(Suppl 1):A110.